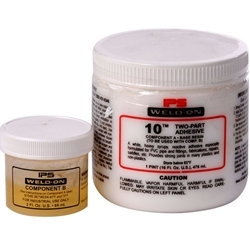 WELD-ON 10 is a two-part, white, high strength adhesive. It cures by the reaction of base Resin A with Catalyst B.
WELD-ON 10? is formulated for large PVC (Polyvinyl Chloride) pipe and fittings, but has been found to bond many other plastics and non plastics. Preliminary tests show good bond strength with PVC (vinyl) ? rigid and flexible (with low plasticizer content), ABS, polycarbonate, styrene, acrylics, butyrate, hard rubber and possibly others not yet tested. It also bonds well to steel (plastics to steel or steel to itself), aluminum (not anodized) and other metals, concrete, and other substrates. It does not bond well to Neoprene or other synthetic rubber, Delrin, Celcon, and a few other plastics. WELD-ON 10 is recommended for a variety of applications due to its high strength and versatility as a structural adhesive. It is used in the sign assembly industry, for bonding different metals to itself, or a variety of plastics. It also has many uses in other fabrication industries that bond ABS, acrylic, polycarbonate, PVC, other plastic and metallic substrates.
? Open time 25 min.